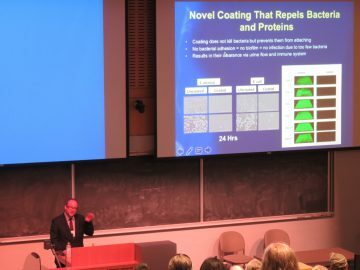 Vancouver Health Research Institute recently wrote an article on the Stone Centre’s Dr. Lange and his metagenomics project. 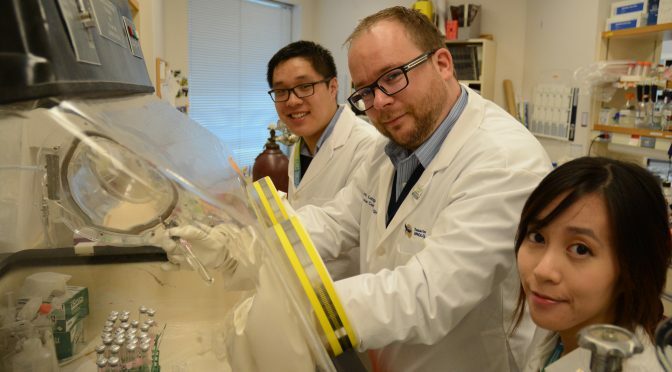 The project looks to break down and understand the relationship between bacteria in the gut of kidney stone formers and how this bacteria may potentially be contributing to stone disease. 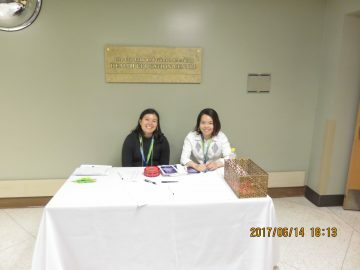 Congratulations Elliya Park for winning the Best Speaker Award at VCHRI’s 2017 Research Medicine Expo! 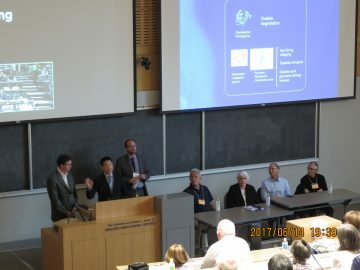 Elliya’s talk presented at the Vancouver Coast Health Research Institute’s 2017 Research Medicine Expo at Vancouver General Hospital – “Erythropoietin Signalling After Ureteral Obstruction” won Best Speaker Award! Elliya Park is a master’s student at the Stone Centre Laboratory who work s under the supervision of Dr. Dirk Lange of Urologic Sciences. Her research at the Stone Centre focuses on erythropoietin signalling after ureteral obstruction. This research has many implications in urologic medicine with respect to recovery of the ureter after it is obstructed (in particular by kidney stones). PATIENT ENGAGEMENT DAY RECAP 2017: SHATTERING STONES – WHICH TREATMENT IS BEST FOR ME? The Stone Centre’s 4th Annual Patient Engagement Event: “Shattering Stones – Which Treatment is Best for Me?” was another successful night in what has become a cornerstone event for the Stone Centre team and it’s patients. The main goal of this year’s event was to educate the general community on kidney stones and in particular the treatments available for kidney stones. By educating patients on the various treatment options, the Stone Centre team wants to promote healthy and knowledgeable decision making with respect to stone disease, as well as to minimize any confusion or misunderstanding about stones. Additionally, the Stone Centre team wants to foster a sense of community between the Urologists, Researchers and Stone Patients so that no patient feels helpless or alone in their fight against kidney stones. 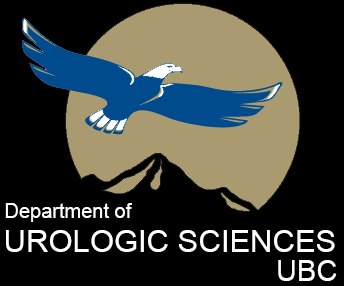 The event is non-profit, and is sponsored by community donors that graciously provide us with the venue, refreshments, snacks, and door prizes. We collaborate with both Vancouver Coastal Health as well as the VGH Foundation many months in advance in order to organize and provide the best event possible for our patients. 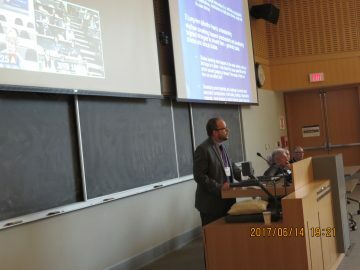 Following this presentation, Dr. Dirk Lange, the director of Basic Science at the Stone Centre, presented on the various clinical projects that are ongoing at the Stone Centre. This included interesting information on the prevalence and role of antibiotics during stone treatment surgery, in particular for infection stones (struvite) which the Stone Centre is the first to conduct. This presentation also touched on the sensitive topic of antibiotic misuse. One of the goals of the Stone Centre’s research is to determine effective, efficient and appropriate antibiotic regimes to prevent misuse and promote health and well being. (For more info on any of our antibiotics study, please click HERE to visit our active clinical trials page). The presentation portion of the event ended with a question and answer period. Guests were invited to submit questions on slips of paper that were then answered by Dr.’s Chew, Paterson Lange and the patient panel. Raffle prizes were drawn which concluded the formal presentation portion of the event. 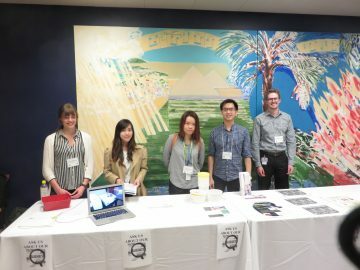 The last half hour of the event featured a mingling session in the lobby of the Paetzold auditorium with light refreshments and snacks provided. The whole Stone Centre team from both the clinical and laboratory sides were available to answer questions from any of the guests. 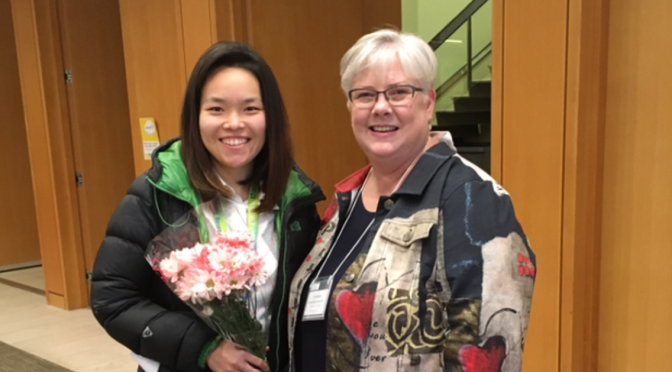 The Stone Centre’s dietitians – Judith Andrews and Lynn Tomita – were also available to answer the many questions about diet, prevention and stone disease. Arielle Locke and Elliya Park, Graduate Research Assistants of the the Stone Centre’s Laboratory Team! If you would like to get involved in the Stone Centre’s ongoing research, or if you would like to get involved with the Stone Centre as a volunteer please visit our CONTACT US page where you get can in touch with us through either email or phone. If you took home a study package at the event and have any questions please feel free to contact us as well. The Stone Centre is always looking for ways to improve its quality of care and research. If you would like to contribute an idea, or have feedback regarding the event please send us an email as well. 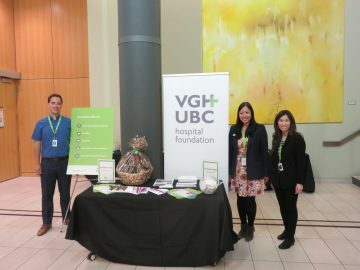 A big thank you to the VGH Foundation for their help in organizing the event, printing materials, social media presence and helping with setup and takedown! A big thank you to our sponsors this year who provided the snacks, refreshments and raffle draw prizes! We look forward to seeing you all again at our next event! We invite you to join us for the fourth annual Stone Centre Patient Engagement Event. Important Info: Come join the Stone Centre Team for a night of interesting discussion and presentations about kidney stones and the various treatment options for kidney stones. There will be time for questions as well as dieticians on hand to answer diet related inquiries. Light refreshments will be served. Guests are absolutely welcome! 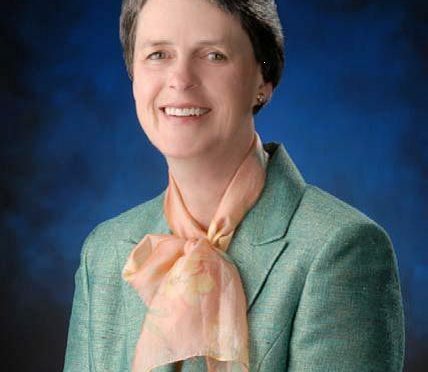 Congratulations to the Stone Centre’s very our Dr. Elspeth McDougall for receiving the American Urological Association Presidential Citation for outstanding contributions to education and innovative learning methods in Urology. 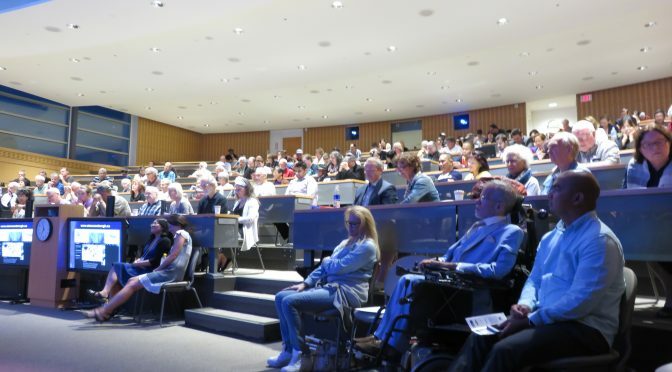 The Stone Centre’s third annual patient engagement night – Kidney Stones: The Latest on Prevention, Treatment and Research was another successful educational event! 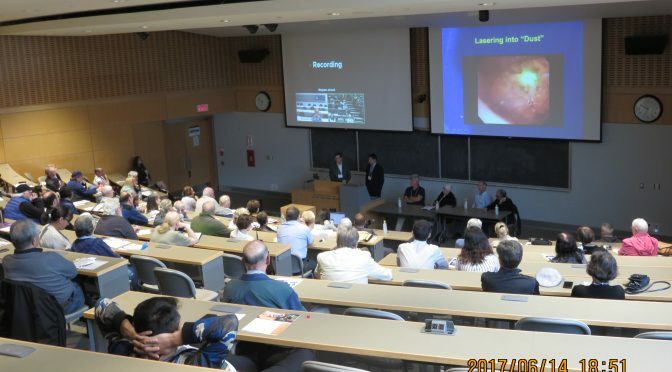 The goal of our event was to pass on information to the kidney stone patient community through educational talks and presentations from the Stone Centre’s urologists, researchers and dietitians. The night began with a presentation from Dr. Ben Chew regarding metabolic syndrome and kidney stones. 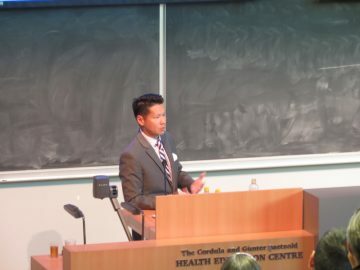 Dr. Chew then discussed the various dietary o ptions that have been clinically proven to reduce the risk of stone disease. 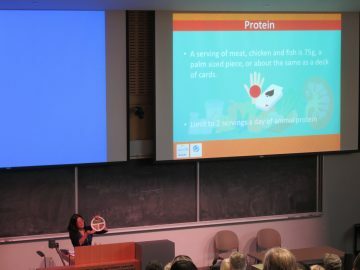 This presentation was followed by talks from dietitians Judith Andrews and Lynn Tomita. They continued with the theme of dietary advice and went into thorough recommendations for fluids, sodium, fruit and vegetables, protein oxalate and calcium. Dr. Chew and the dietitians then had an engaging back and forth discussion regarding some of the finer points of dietary oxalate recommendations. 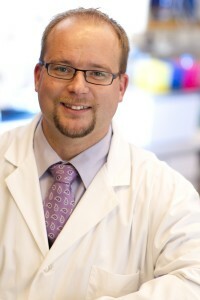 Dr. Dirk Lange, the director of basic science research at the Stone Centre, was the final presenter for the night. 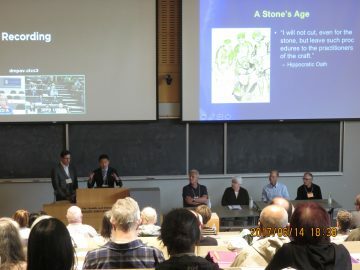 He went over the ongoing and future research that is being conducted by the Stone Centre laboratory team. This event was made possible through contributions from many different people and organizations. 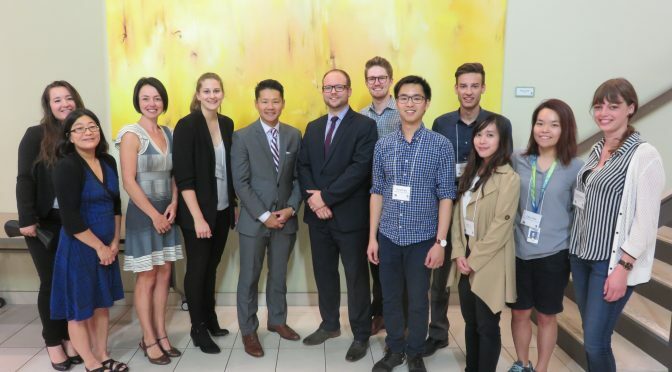 We would like to thank the Stone Centre laboratory research team for their outstanding efforts in research as well as for their help in setting up the event. If you saw them at the event, the lab team was busy answering your questions regarding research and stone prevention! 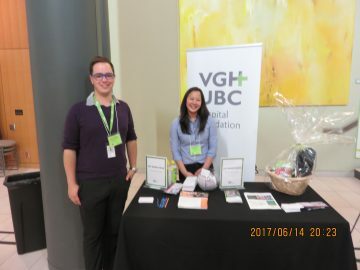 We would also like to thank the VGH Foundation; specifically Joey Cheung, Tim Staunton and Nathania Lo for their help in organizing and setting up the event. A big thank you to the Stone Centre Advisory Group – who volunteered their time to ensure that we were answering questions and covering content that is relevant to patient needs. Their contributions played a huge part in the success of the night event. 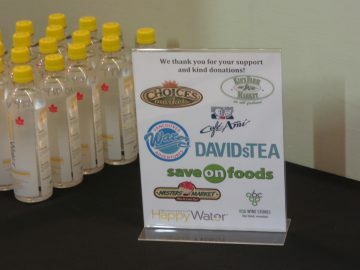 Also, thank you to our charitable sponsors for providing food, refreshments and prizes! 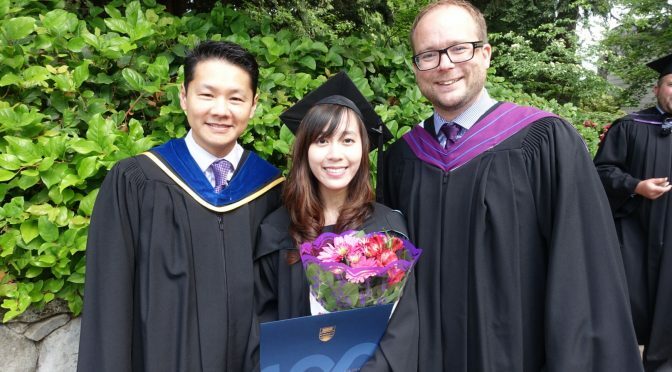 Congratulations to Joey Lo – the stone centre’s very own – for completing her masters! Joey Lo has been with the Stone Centre for several years, initially as a co-op student and then later as a M.Sc. candidate. 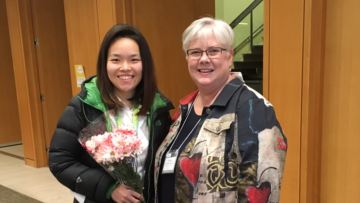 She has worked closely with Dr. Lange and Dr. Chew to complete her graduate degree under the UBC Experimental Medicine Program. 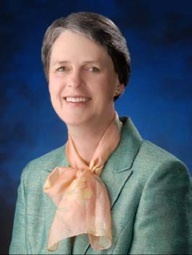 Her main research focuses on the use of antimicrobial coatings on urinary catheters to prevent bacterial attachment and subsequent infections, a project done in collaboration with several specialized laboratories at UBC located under the departments of Pathology, Chemistry, and Materials Engineering. Joey has been an integral part of the research team both as a student and now as a research assistant. 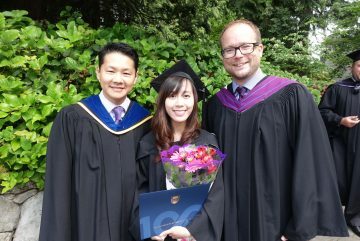 The Stone Centre Team wants to extend its most sincere congratulations to Joey for finishing her M.Sc. degree and wishes her success in her future endeavors!